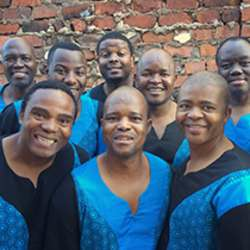 With the power of gospel and the precision of Broadway, Ladysmith Black Mambazo is the undisputed king of mbube, South African a cappella singing. The multi-Grammy-winning group came together in the early Protected content , has extensively worked with Paul Simon, and continues to thrill audiences around the world with its strong, proud melodies harmonized in layers of call and response. The show will be held in the historic auditorium of Harvard's Memorial Hall (doors at 7pm, show at 8pm). We will be at the beginning of row AA in Balcony B. Tickets are available to purchase by the venue online (or probably at the door). I've been waiting to see this group live since the Protected content . It should be a great performance!